StEEP Road to the Olympics’ Open Beta will be available from November 28th to December 4th, 2017. The Open Beta will be available for all players on PlayStation 4 (including enhanced features on PlayStation 4 Pro), Xbox One (including enhanced features on Xbox One X), Uplay PC and Steam. The Open Beta will feature five challenges from StEEP Road to the Olympics and free roam in a select area of the Japan map. Players will be able to compete in two Olympics events in the South Korea map, Downhill and Big Air, and overcome two snowboard and one wingsuit challenges in the Japan map. Players will also be able to explore and free roam in a segment of the unique Japan map. Preload for the Steep Road to the Olympics Open Beta will be available on November 28th at midnight local time on PlayStation 4 and Xbox One and Xbox One X, and at 23:00 UK time on Uplay PC. Servers open on November 28th at 17:00 UK time. The player who finishes on top of the downhill leaderboard at the end of the Open Beta will have a chance to win a ticket to the Olympic Winter Games PyeongChang 2018 in South Korea. More details coming soon. The expansion StEEP Road to the Olympics can be purchased for £26.99. StEEP Winter Games Edition, which includes the base game Steep and the expansion, can be purchased for £39.99. StEEP Winter Games Gold Edition, with the base game StEEP, the expansion, and the StEEP Season Pass , which gives players access to three previously released add-on packs featuring additional sports, challenges and outfits will be available for £59.99. 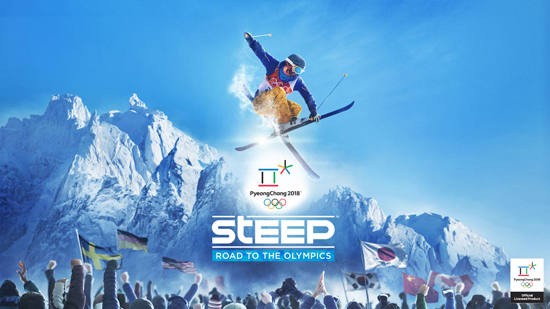 StEEP Road to the Olympics, the official videogame of the Olympic Winter Games PyeongChang 2018, is an expansion to the open world action-sports game Steep (launched in December 2016) featuring skiing, snowboarding, wingsuiting and paragliding. With development led by Ubisoft Annecy, StEEP Road to the Olympics features a story mode in which players will experience the journey of a young athlete training in three freestyle events (Big Air, Half Pipe and Slopestyle) to reach the Olympic Winter Games and be the first athlete ever to win gold in 3 freestyle events. The competition takes place in the South Korean mountains, where the Olympic Winter Games are being held this coming February, 2018. Players will also be able to explore the mountains of Japan, carving through unique powder and exceptional environments. StEEP Road to the Olympics will be available on December 5th, 2017 on PlayStation 4, Xbox One and Windows PC.